Ailsa Sutcliffe, GSA Archives volunteer, continues with the final instalment of the story of John Charles Lamont, listed on the GSA WWI Roll of Honour. In addition to their strong Glasgow connection and mutual residence in Kirkcudbright, Sivell and Lamont also married into the same local Sayers family. It is suggested that Lamont first encountered Elspeth Sayers at the marriage of Sivell and Isobel Sayers in Glasgow, 1923, just two years later they too were wed. The couple moved to Kirkcudbright in 1928 and built their home, Millfield, directly next to the Sivell’s home, The Hollow. Next door neighbours as well as brothers in law, the pair were close to the point of inseparability. In addition to marital and geographical bonds, Lamont and Sivell worked together as professional artists. 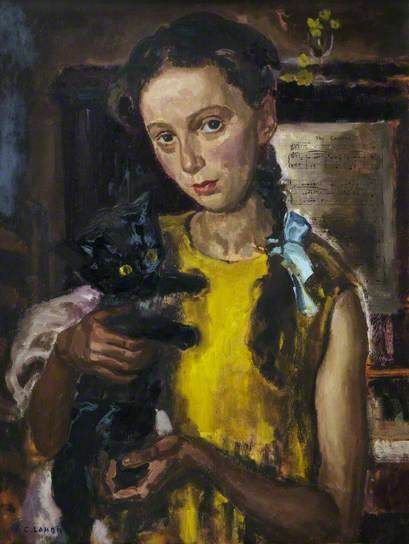 Both vibrant portraitists, they were both supporters of the Royal Scottish Academy and regularly painted each other and family members. 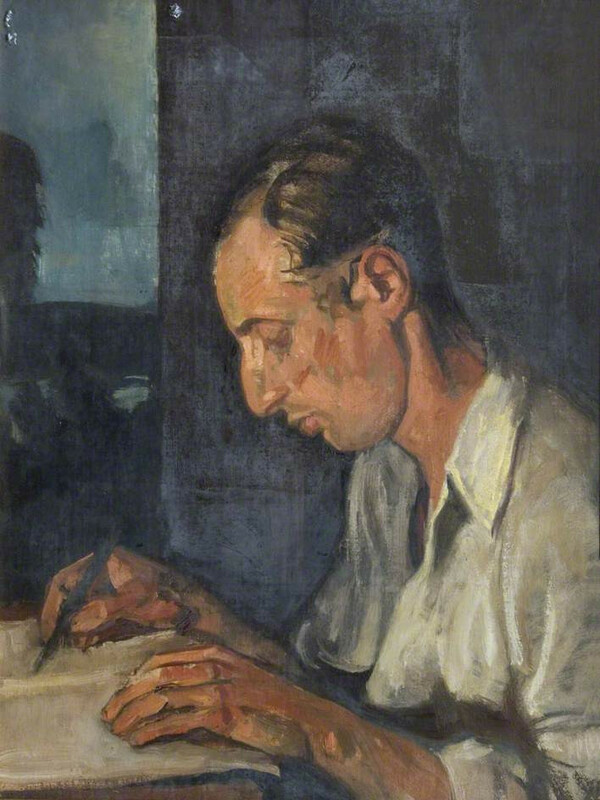 There is a particularly atmospheric portrait of Lamont by Sivell in the Gracefield Arts Centre, Dumfries, depicting him writing in a journal against a dark backdrop, the glow of the lamp warming a chiselled face in a pleasant contrast to the coolness of the room’s interior. The pair were also closely linked to fellow Glasgow School of Art graduates Archibald McGlashan and James Cowie. The group became well known as an artistic assembly, working together to fund exhibitions and were readily encouraged to analyse and examine some of the finest examples of works produced during the Italian renaissance. Although Cowie, McGlashan and Sivell founded the Glasgow Society of Painters and Sculptors together in 1919 and were much more prolific than Lamont due to his ill health, Lamont held his own and was successful on a smaller scale, regularly exhibiting at the Royal Scottish Academy and frequently praised by the press. In 1948, the year of his death, the RSA annual report paid tribute by stating: ‘His work never associates itself with the heroic or the fanciful; rather it is concerned with the constant truths with which he lived in a circumscribed part of the world. His approach was completely objective, his subject the tender moods of the human, intimate, individual scene.’ Indeed, the majority of Lamont painting examples available in the public domain tend to feature his daughter, Anne, or the Kirkcudbright landscape. One of Sivell’s best known works is a large scale mural which was once situated in a Student’s Union bar, Sivell’s, named after him. Sir William Hutchison writes in the 1960 memorial exhibition for Sivell, ‘It would require a visit to the Students’ Union in Aberdeen to savour the full stature of Sivell the artist. For the decoration of that hall is without doubt the greatest mural painting carried out in Scotland during this century, and perhaps any other…’ (Haig, p.75). Sivell and Lamont were very different in spite of their similarities. Lamont was gentle and peaceful while Sivell could be antagonistic and abrupt, perhaps due to his longterm monetary struggles. Lamont worked on a small scale and was content in spite of his physical inability to produce work while Sivell painted tirelessly and obsessively until his death, fuelled by ambition and passion. Regardless, they remained friends until death. The discovery of such a captivating and well-documented friendship is an extremely rare occurrence while researching the Roll of Honour. Through John Charles Lamont I was led to his alliance with Robert Sivell, Archibald McGlashan, James Cowie and Benno Schotz. Each of these individuals have their own intriguing stories which are waiting to be explored.